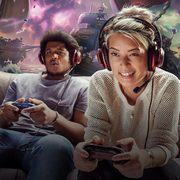 Microsoft Microsoft Store: Get Three Months of Xbox Game Pass for $1.00 Get 3 Months of Xbox Game Pass for $1! Play over 100 games for just a loonie with this deal from Microsoft, because you can get three months of Xbox Game Pass for $1.00! Xbox Game Pass is a subscription service that lets Xbox One owners download and play a library of over 100 complete games, including Just Cause 4, Minecraft, Shadow of the Tomb Raider and more! The service normally costs $11.99 per month, which means you'll get an overall savings of $35.97 with this three-month deal! This deal also marks a new historical low price for a three-month Xbox Game Pass subscription, beating the previous benchmark of two months for $2.00 last seen in February. This offer is effective online only until May 12 -- there are some restrictions, as users in Quebec and Russia are not eligible. Note that once the three-month subscription period is over, you will be charged the standard quarterly rate, so remember to disable auto-renewal if you do not want to keep the service. Cool. Currently subscribed so can't take advantage, but great deal. I only see one month for $1. April 11 it starts the $1 for 3 months. Just an FYI that this deal is showing up on their website now, although every time I try to subscribe I get an error, hopefully others have better luck. Likewise. After selecting payment method, website just hangs for a minute or so then error says "Try That Again"
I am getting $14.99 for 3 months which isn't too bad but $1 would be better! Will it stack on free trial? At first I tried subscribing using the US site and I got that message. When I switched to the Canadian site I was able to check out without any issues. I tried this but didn't work for me, searched specifically for Microsoft Store Canada, went to Xbox deals, it shows the offer but just times out. Did you subscribe to the recent 2-months for $2 deal? 3 months 50% off for current subscribers working now. Nope, I had taken advantage of that deal from way back where you could stack months of the same offer but my subscription ended a couple of months ago. Oh well! Keeps crapping out on me after the credit card info. I'm currently on the 2 months for $2 deal until the 20th. Theoretically I should qualify for this offer if I wait until the 21st and let my current subscription expire, right? My $2 for 2 months subscription ended on Monday. I'm getting an issue when trying to sign up and it's not letting me. Anyone else? Same, my $2 2 month ended on tuesday, I can see the offer, after i put in my payment info it says try again later. I went to sign up . Told me something happened on their end and to try again later. Got email from paypal for $1.13 to Microsoft though? Edit: They just sent me a refund for the money? Wtf is happening lol? anyone actually got this deal yet? This is happening for everyone, US included. Just checked Reddit and same issue for all. Relive your glory with 300 built-in arcade classics.